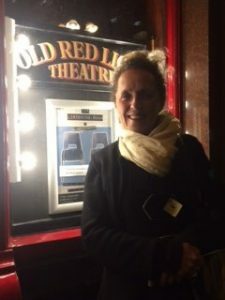 A ‘powerful play called ‘The Listening Room’ which took the true stories of five people whose lives have been transformed by a single violent crime to the stage has just concluded a successful run at the Red Lion Theatre London. Written by Harriet Madeley the powerful play which explores what happens when the five victims of crime meet their aggressors via Restorative Justice (RJ). Lucy Jaffe, Director of Why me? was invited as guest speaker to talk to audience at the conclusion of the play. She spoke about the value of Restorative Justice to victims, how it can empower and help rebuild the confidence of victims whilst answering questions that may remain unaddressed by the court case. Playwright Harriet Madeley captured the tumult of emotions that victims and many offenders encounter when taking part in RJ. The actors explored motivation, retribution, rehabilitation and forgiveness all of which feature in RJ in some way.